Review question 1: Will livestock and fish production ‘by the poor’ really contribute to nutrition ‘for the poor’? While designing the Livestock-Fish proposal, our working hypothesis has been that small-scale livestock and aquaculture systems are an important source of the limited amounts of animal-source foods (meat, dairy products, eggs) that currently figure in the diets of the poor, and that by increasing productivity and targeting the poor in these production systems and their associated value chains, we could simultaneously improve food security, reduce rural poverty and reduce under nutrition (which now figure as 3 of the 4 CGIAR system-level targeted outcomes). Much of the supply of animal-source food in lower-income countries still comes from small-scale systems and will continue to do so – i.e., small-scale systems remain competitive for many products and markets vis-a-vis large-scale systems. Production from small-scale systems not consumed on-farm enters domestic markets for lower-value products, e.g. the extensive informal markets for raw milk in East Africa and South Asia, and these are the markets where both rural and urban poor largely buy their animal-source foods. ASF generally represent a small but extremely critical share of the diets of the poor, with even marginal increases making important contributions to improved nutrition and health. Evidence from our work and the literature to support these statements is cited in the proposal on pages 2-5. We stress that these are patterns characterizing lower-income countries particularly in sub-Saharan Africa, South Asia, South East Asia, and Central America. The situation is obviously dynamic and evolving and there are certainly counter-examples from some of the emerging economies, such as the importance of large-scale pig and poultry production in China, but we expect these patterns to persist in the countries and contexts that will continue to be the focus of CGIAR efforts. We propose to address this recommendation by putting better into perspective our focus on small-scale production systems and their associated market systems in meeting the needs of the poor for animal-source food. The figure below is perhaps a good starting point. 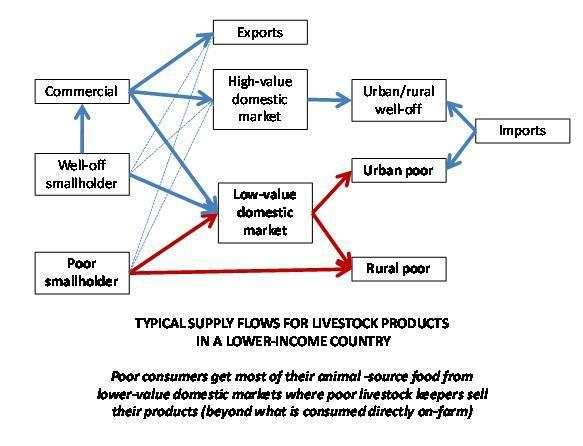 The figure presents typical flows of livestock product supplies in a lower-income country (due to economies of scale issues, fish production may be related more to small and medium-scale commercial aquaculture rather than smallholder farms as such). An important feature of livestock and fish markets is the linked nature of high and low-value local markets: production of prime cuts for better-off consumers or export at the same time supplies lower-priced by-products to the lower-valued market for lower-income consumers. Pro-poor productivity improvements would increase supplies generated particularly by poor livestock keepers in the medium term, but also undoubtedly increase production among better-off smallholders through spillovers and as the benefits to poor livestock keepers lead them out of poverty into the better-off group. Though some benefits would be captured by the better-off smallholders, we would view this as an added indirect and positive outcome. Much of the new production will supply lower-value domestic markets, where our pro-poor value chain development efforts will seek to improve efficiencies and benefits for the poor dependant on these value chains for their livelihoods. Improved efficiency at farm and market level and increased supply will keep downward pressure on prices, keeping products in these markets affordable and accessible to the rural and urban poor who depend on them for their ASF, allowing them to improve –or at least protect—the quality of their diets. We fully recognize that there is a lot of ‘leakage’ across markets and producer and consumer groups, which one reviewer raised as diluting potential impact. For example, some of the smallholder production increases can be expected to end up in commercial production or higher-value formal marketing systems serving the better-off consumers. But such leakages also contribute to positive outcomes since they imply increased income is captured by the poor—contributing to more and better food purchases—and because the linked nature of the two markets means that increased supplies to high-value markets also result in more by-products going to the lower-value markets; therefore, we do not see such leakages creating any fundamental inconsistency with the stated objective of the mega program. These and other specific comments by the reviewers question specific pathways by which smallholder production can be expected to translate into more consumption of animal-source foods by the poor; the framework described above begins to describe the complexity of the flows of products and associated benefits. It highlights the fact that there will inevitably be many leakages, but by focusing on pro-poor productivity improvements both in small-scale production and informal market systems, we do nevertheless in the end increase the availability, accessibility and affordability of animal-source foods for the poor, which is the goal. We start from the principle that the high income elasticity for animal-source food demonstrates there is clear demand: the poor want more animal-source food in their diet. And they should want more: on pages 3-4 in the proposal, we highlight conclusions from the nutrition literature regarding the strategic nutritional value of animal-source food for nutritionally challenged populations, particularly those becoming increasing dependent on a narrower set of plant-based foods that do not offer the full range of micronutrients needed. Increasing supply and keeping downward pressure on prices in markets where the poor source their animal-source food will offset risks of relying strictly on least-cost foods. Do you agree or disagree with our reasoning and that it reflects the reality in low-income countries? Please share specific examples, especially those that we can reference from the literature, that support your view. We would appreciate any suggestions that you feel would strengthen or otherwise improve our line of argument. We would particularly appreciate any examples that demonstrate targeting poor producers will benefit poor consumers. This will help us enormously in challenging our own arguments and tightening them up. It shows how there is a move towards middle class in Africa. There will always be poor people, but with ways to make a living and feed themselves, they don’t have to remain poor. Maybe part of your argument should be not just that more meat/milk will be available to the poor, but that their ability to engage in livestock production as a business will provide them a source of money to buy any food items the wish–meat, milk, grains, etc. I fail to see how this is an argument for denying investment in livestock production for poor. The middle class and wealthy also have access to non-animal protein sources, yet they continue to drive markets in animal-based foods. Are there studies out there that show that poor people would consume more meat if it were more available and more affordable? If so, I would very much like to know of them. FAO and World Bank have excellent publications that show a sky rocketing demand for pork and poultry across the world, with less but still growing demand for beef. It sounds like your views align well with ours. I tried to see the WSJ article, but could only see the 1st couple of lines; presumably it highlighted the fast growing demand for meat in Nigeria as the middle class grows. Thanks. Basically I agree with your approach and reasoning. Living in a small village in Thailand I see how the poor try to better their standard of living and nutrition. However I have empathy with the view that the genetic section of the proposal exaggerates the role of genomics at the present time. The major problem for the poor is access to good genetic material – whether it be indigenous local breeds or others. Thailand has now some excellent examples of the government farm playing a crucial role in improving and distributing indigenous poultry. Davis, I quite agree with you partially. It is true that the intervention will accord the poor farmers the opportunities to buy other food items which were initially beyond their reach before the intervention. However, based on personal interview conducted with some farmers in the sudan savanna zone of Nigeria, the protein intake through livestock sources equally increased because according to the farmers, a challenge program helped to improve their status. This was the IAR4D introduced by FARA SSA CP. Thus, CIAT, ICARDA, ILRI and WorldFish are very correct in their approach. 1. Productivity should go along side with market access as well stated in the proposal. Key to the discussion about low income countries is market imperfections wich make it difficult to directly link any productivity increase to income generation and therefore improved consumption and nutrition. Consumption patterns and consumer behaviour also differ in low income countries due to low education and lack of information. There was also debates about gender issues and nutrition, where income being controlled by the men leads to even deteriorating nutrition status of the household. So, the impact of productivity on nutrition should be improved by improved market mechanisms and improved education and other institutional and organisational conditions. 2. The distinction between the poor and very poor (see consortium Board comment) should be made clear. The very poor are sometimes defined (based on community perceptions) as those without assets (no livestock for example) and therefore these categories may not benefit from productivity targeted interventions. 3. Targeting poor producers leads to “spillovers” to better-off smallholders. The opposite is also true. Targeting the better-off could play a tool to promote sustainable development. In dairy production starting with the more productive farms (the better off) maybe the key to successful implementation of dairy processing and other development interventions. Regarding point #1: An IFPRI review of agricultural and food-based nutrition interventions has shown that better nutrition results from a combination of higher food production and nutrition education. We will seek to partner with the component of CRP 4 on making ‘nutritionally smart’ value chaines, which should strengthen this aspect in our efforts. Point #2: By focusing on pro-poor strategies all along the value chain, some of the asset-less ‘very poor’ may find off-farm employment opportunities in fulfilling trade and processing services. Point #3: It would seem appropriate to target our public research on pro-poor strategies that generate impacts more directly. Adding figures on product flows could contribute to strenthening the arguement. For example, a third of the milk produced by smallholders in EA is usually consumed on-farm, and the rest either sold to rural poor neigbours or various market actors in low value domesic markets at 20-50% of the price in higher-value domestic markets. 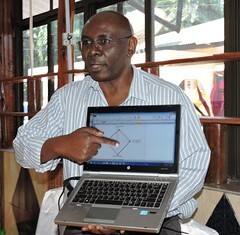 Specific figures from Kenya may be found in a milk flow-chart available at: http://mahider.ilri.org/handle/10568/2177. Additional relevant information on consumtion patterns is available at: http://www.smallholderdairy.org/policy%20briefs.htm. Perhaps similar figures for meat and fish are also available and could be added. Perhaps we could insert a box into the proposal that describes the East Africa dairy example. Yes I agree that increased/improved livestock /fish productivity at the low-income producers sub-sector would improve the nutrition and health of the poor through increased food consumption, especially among the “rural poor”. This was confirmed by the USAID-SR-CRSP during its work in western Kenya (1980s and early 1990s) where a small increase in goat milk production evidently led to milk consumption by the children of the small farmers. The evidence is also traditional: all small scale livestock producers (pastoralists and mix crop-livestock farmers) consume livestock and livestock products when there is a “surplus”. An example could be derived from the recent WB study in Zambia (which I presented last year – May 2010 – at the Livestock Week in Rome): Although the commercial slaughter is slowly gaining grounds in Zambia, the traditional and non-commercial slaughter (obviously translated to consumption by the low income populations) are the most dominant (57% and 33% of the dressed weight and 49% and 33% of the dollar value, respectively). The presentation could be accessed at the hyperlink: VCA Presentation Livestock Week (IALDG) 4 May 2010 Final.pptx. A major problem (especially for the low income non-livestock producers = the ”urban poor”) is the generally high and unaffordable costs of livestock and livestock products, that persists without a real improvement in hygiene, food safety and quality. This fact makes it important to link increased productivity with measures that lower production costs and retail prices. The Zambian case is very helpful. We need to find out if there are data available from expenditure & consumption surveys that would allow us to quantify how patterns differ across income levels and urban/rural — that will help to complete the picture. yes, I agree with this view. Women, children and young people residing in rural areas are getting limited amount of protein (animal protein) which couse deficiency in essential amino acids and resulted malnutrition in children, stunted groth in young. This idea will help for these problem. Working towards increased/improved livestock /fish productivity will be a major step towards reduction of hunger, malnutrition and alleviation especially in Africa and some other nations in the developing world. In Kenya, for example,fish – like tilapia and even nile perch- is nowadays cheaper in the city of Nairobi than along the lake region. Still the government’s effots to have fish ponds in all parts of the country will only succeed if tchnical and expert input becomes available and the CGIAR project will be ideal. Being a journalist who has in past reported all aspects of CGIAR activities I am bound to say that there is room for expanding and improving livestock sector. The emerging interest in local or indigenous poultry and cattle will definitely result in improved productivity. Still, in the bigger picture, there is room for the wildlife sector to gain from the science behind improvements in the “livestock” sector. Income and nutrition will improve in East and Central Africa if various types of antelopes, deer,and even ostrich, guinea fowl quail etc also get attention. There is bound to be the much needed rapid increase in quality and quantity livestock and fish in rural Africa. On my opinion of giving reply that livestock and fish products will meaningfully contribute the nutrition for pro-poor is highly positive this proposals of the mentioned value chains developments will rekay upgrade nitritionally for pro-poor because middle(pravite)will make avialable passing these commodaties easly to the pro-poor with reasonable prise. I mean that since pro-poor livestock keeper are not settled and not in position of handling the projects then the pravites should be invested and this capital will reach and trigger in upgrading nutritional status of the pro-poor,as a drafthing economy. The scenario can be very variable. Speaking from the point of poor in some countries that don,t have any land or resources to use. What then? Are you planning to give them the resources they needed? I think you must first define who this poor you are referring. The common constraints from what I’d experience doing researches related to your proposed project is the sustainability. During the period of conduct, the results can be very significant. However, few years later the impacts degraded. What can I suggest is to defined who this poor are and how they could help to assure the level of food security within their level. In the first place, what they produced mostly went to market instead for themselves. So, how it can contribute to their nutrition…. I am shocked that we are discussing nutritional benefits from livestock (fish) without mentioning gender dynamics of production and control. Who in these “poor households” will be targeted with resources to increase fish production? If the target is women, there will be more self-consumption among producers than with men, and purchase of other food items will increase. Will there be other interventions to sell to wider markets? Women are more likely to sell locally, which increases supply to other poor families. Will the women be allowed to keep their profits, or will husbands appropriate it? “Poor households” are not homogeneous units where cash, labor, products or even information are shared. Women and the poor have the least power and information to pursue productive outcomes, and leaving the distribution of benefits to the market reproduces the status quo. Successful development interventions not only target resources to those who need them the most, like women in poor families, they also must help those communities address harmful division of labor and benefits. Similar marketing interventions to help poor men and women learn how to expand and keep market share are essential. My research in Western Kenya clearly indicates that pigs are sold by small holder farmers between harvests to enable them to buy food and/or seeds and fertilizer for crops. Livestock does improve the nutrition for the poor. There is another key aspect of small farmer livestock raising that needs to be raised. In a very large way, livestock is the farmers’ “piggy bank”, a source of emergency funds and a fallback in case of calamities. Although a farmer will primarily raise goats or pigs for eventual sale, the livestock comes in handy if somebody in the family gets sick, or money is needed for an emergency. Without the animals, the farmer will have to borrow at high rates from informal lenders, or sacrifice the upkeep of his farm to attend to the emergency, thus complicating his situation. It is these types of setbacks that sink the farmer deeper into the debt hole and make it almost impossible for him to exit from poverty. So having this “piggy bank” on hand has a direct, significant and long-term impact on poverty and nutrition. I have also seen many farmers being able to put their children through school by raising livestock. Some have been able to acquire new assets by selling their livestock. For a farmer, the nutritional benefits of livestock are secondary to the incomes and cash they bring to their family. In fact, a farmer would rather sell a pig for money than slaughter it for his family. However, this additional resource enables the farmer to eventually buy the food that he wants and the nutrition that his family needs. Tom I will look for expenditure and consumption data. Also you could google search for reports of works by SIDA,USAID,WBj; as wells as MofAR ,Zambeef and Parmalat reports. 1. In India where majority are vegetarians milk is the main source of animal protein and any improvement there will benefit majority of the population. 2. Traditionally suplus milk (after meeting family needs) was sold but market pull disturbed the system and the change has become a topic of debate. Operation Flood related studies show that market intervention without improving productivity leads to reduction in milk consumption by the producer. 3. Dairy Cooperatives in India are a good example of ‘decentralised small holder production and centralised processing and marketing’ as a result they can get benefit of the growing market. However, much of the milk is still handled by informal-traditional sector but the Coops. control the milk price. 4. Unfortunately there is no organisational support for those keeping small stock and backyard poultry – these families are from even lower socio-economic strata. There are studies to show that malnutrition is lower in families keeping livestock/poultry (I may be able to provide pecise ref. after some time). Middlemen exploit them and organising them to take benefit of increasing demand and checking losses maybe more crucial than providing more productive livestock or poultry. 5. The traditional marketing systems should be critically studied before planning intervention. The traditional markets are a good source of cheap livestock products and any improvement in hygiene and quality would be very desirable. There are other linkages between traders and producers that need to be considered (easy credit etc.). 6. I hope ‘Productivity improvement’ is considered from a wider perspective since in most cases breeding intervention is considered the only way to improve productivity. We all know thatthere is very high demand of high nutrition value chains, as reguarding to the nutrition value of livestock ” poultry and fish ” give egg and white meat that are economic and affordabale to the nedy pro- poor war-vetarain asuring, foraging and upgrading the nutritional status and livelihood. There are many issues arising from the comment made by the reviewer…. There is an FAO paper on ‘ good practices in the governance of small scale fisheries’ which discusses those. Poverty in small scale fishing communities is a complex issue. Contributing factors relate to the unpredictability of the fishing profession and the vulnerability (located in coastal areas, sensitive to climate change), and the fact that small scale fishing communities tend to be socially/politically marginalised (this shows for example in the lack of public investments in basic public services for the small scale fishing communities, or in the lack of recognition of small scale fishermen access rights to fish resources) and economically disadvantaged. 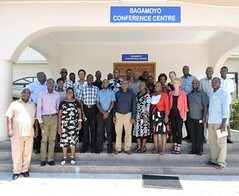 There is a recognition by FAO of this vital contribution of small scale fisheries to food security, and small scale fisheries is now a major area of work for the FAO.